You have just received your package from Aroma Seize , you open it to find the products that you have ordered, and you pull out your first candle! You might think that burning a candle is simple, but there are a few things that you might not know. Below you will find our recommendations for getting the most out of your Aroma Seize candle. so be safe and smart with candles and be sure to extinguish them before you leave the house or go to bed. The First Burn is the Most Important! The first time you burn any candle, burn it for 2-3 hours. This will not only maximize the fragrance throw, but also help avoid “tunneling”—where the candle burns down the middle, leaving wax around the edges. Trimming the wick to 1/4” before burning helps ensure a smaller, safer flame and less soot. Try trimming your candle with nail clippers, the width of your littlest finger is a good guide to the correct length. Your Aroma Seize candle will come to you with a quarter-inch unlit wick. If you ever receive a candle that has a longer wick, trim your wick to a quarter-inch before lighting the candle. You always want to re-trim your wick to a quarter-inch following a burn, making sure that you remove any part of the wick that has become bulbous. When your wick gets too long, the flame gets bigger and the long wick tends to curl over, displacing the flame from the center of the candle so that it ends up closer to one side. Also, shorter wicks are safer because it keeps the flame smaller. Be careful not to trim your wick too short or you might not be able to re-light your candle. Keep your candles away from drafts, open windows, and fans. A draft will usually increase the size of the flame and blow the flame sideways, causing the candle to burn unevenly. Be sure that candles are set on level surfaces so that the wax will burn evenly. Allow Your Candle to Burn for at Least 1 Hour! Don’t light your candle unless you have at least 2 hours for it to burn. You want to burn your candle long enough that that wax is completely liquid for about a quarter-inch from the top. This will greatly increase your burn time and prolong the life of the candle. Make sure that you don’t extinguish your candle before you get that beautiful liquid wax all the way to the edge of the glass. Avoid Candle Smoke When Extinguishing! Don’t like the smoke when you blow out the candle? Dip the flame into the molten wax to extinguish it. You’ll need a designated tool—we use an old butter knife as our official candle extinguisher at our house. Using your tool, gently push the wick over into the molten wax for a second until the flame goes out, and then guide the wick back into an upright position. That last step is important—otherwise, your wick will be buried when the wax dries. 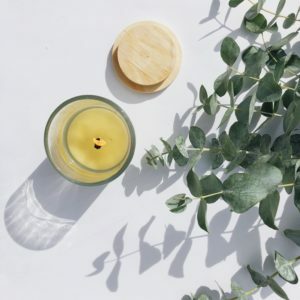 Once you’ve burned your candle, you can easily give your candle-holder a second life by cleaning it out and removing the label and wick sticker. Wash with hot water and soap and you will end up with a very clean glass. Save 10 candle glass holders, email us and let us know. We will send you a label to return the glass to us with a discount code for 30% off your next order.